The first year of Tenth Doctor ongoing adventures hits its jaw-dropping finale as Gabby, Cindy, and the Doctor face a cosmic threat from the heart of the galaxy! From an aging actress unravelling the code of existence from her Manhattan apartment block, through retro-regeneration, a black ops military organisation, a secret cult, and an extraterrestrial artefact of such scale that it warps human comprehension, Doctor Who stories don't get much bigger or more exciting than this! 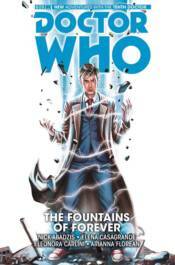 Collects Doctor Who: The Tenth Doctor #11-15 and the tenth Doctor story from FCBD 2015 special.